The largest Persian-speaking Protestant community in Iran, Jama’at-e Rabbani, has announced that it has been stripped of its ownership of Sharon Gardens, a large and valuable piece of real estate in the city of Karaj, by an organization operating under the supervision of Supreme Leader Ali Khamenei. “They have simply charged the community with espionage and convicted them without any evidence,” said Borji, a spokesman for Article 18—which defends the rights of Christians in Iran based on Article 18 of the International Covenant on Civil and Political Rights (ICCPR)—in an interview with the International Campaign for Human Rights in Iran. Unsubstantiated charges about the group’s alleged ties to the U.S. Central Intelligence Agency (CIA) enabled the confiscation of the two and a half acre property by the Headquarters for Implementation of the Imam’s Decree, according to an order by Branch 3 of the Tehran Revolutionary Court, on July 21, 2015, said Borji. The Appeals Court upheld the ruling in August 2016. The Jama’at-e Rabbani Church Council officially went public with the news on December 13, 2016. “The 68 million worldwide adherents of the Assemblies of God wish to express dismay at the recent confiscation of campground and garden property from the Iran Assemblies of God. We hereby request the return of the property to its legal owner,” said a statement issued by the chairman of the World Assemblies of God Fellowship, George O. Wood. “They want to undermine the legitimacy of Protestant churches established before the  revolution, such as Jama’at-e Rabbani, and destroy the foundations of Persian-speaking Christian Protestants in the country,” he added. The Headquarters for Implementation of the Imam’s Decree, which had sued to take over Sharon Gardens, was established by the founder of the Islamic Republic, Rouhollah Khomeini, in 1989 to confiscate properties after the revolution. Today it operates under the supervision of Khamenei and is not accountable to the government or Parliament. Sharon Gardens, located in the Valadabad district of Karaj, has been the location for many Christian youth camps and family picnics organized by the Jama’at-e Rabbani Church Council, which purchased the property in 1974. It is currently worth some eight billion tomans (about $2.5 million USD), according to Borji. Borji strongly denied any connection between Jama’at-e Rabbani to the CIA and the “Philadelphia Church,” adding that no evidence was presented to support the charge. 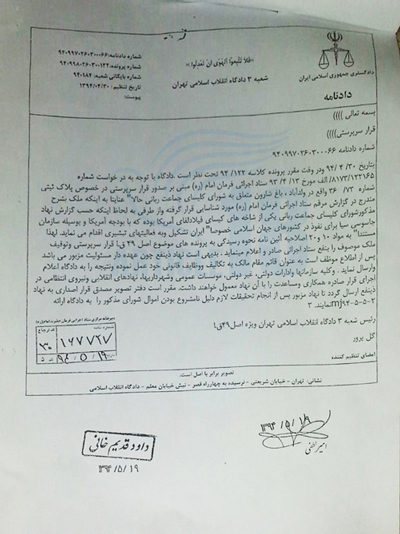 Under pressure from the Intelligence Ministry, the Jama’at-e Rabbani Church on Taleghani (Takht-e-Jamshid) Boulevard in central Tehran had been closed for “major repairs” since May 2013 and several of its priests and members have spent time in prison,” Borji told the Campaign. On November 30, the Campaign joined 18 other international human rights organizations in defending the rights of Christians and all other religious minorities in Iran. Despite assertions by government officials that Christians enjoy full rights as citizens of Iran, the Christian community—particularly Evangelicals and Protestant communities, which are seen as encouraging conversion to Christianity—suffers severe and widespread discrimination and persecution in Iran, as documented in the Campaign’s report, The Cost of Faith: Persecution of Christian Protestants and Converts in Iran.